Saw a new type of distracted driving today on my commute. A guy was trying to drive on the highway, exceeding the speed limit, all while trying to write on his hand with a pen. Oh well, at least he had two hands near the steering wheel. There are 10 rules of winter driving. Don’t get intimidated, they are really easy to understand and remember. I’ll even help by providing a reason why each of the ten rules should be followed. So why do I think these are the 10 rules of winter driving? Well, in my observations, most of the time people end up in a ditch or in an “accident” because they had to do some panic braking because they were following too close to the car in front of them. A couple days ago I observed as groups of cars would drive down the highway, only a few feet from each other. As one driver touched his brakes, the trailing vehicles would all slam their brakes on harder because they suddenly realized it was slippery conditions. Eventually, one of the trailing vehicles spins out and ends up in the ditch because they have discovered one of the laws of physics really does apply to them. Now, don’t get me wrong, I’m not a “conservative” driver. I’m probably the guy passing you in the left lane on a snowy day, even without snow tires! **gasp** What I won’t be doing is following too closely to the car in front of me. Which brings us to rule number 10. Turn your lights on so that your tail lights are also on. I could care less about the front end of your car when we’re driving in the snow. I’m more interested in the front end of my car. When you turn your tail lights on, it provides trailing drivers a visual cue as to where you are. They can see you through the snow before they will be able to see your vehicle. In a sudden white out condition, this can make a huge difference. I can judge my following distance based on your tail lights so I’m not suddenly on top of you as you slam your brakes on due to the white out. 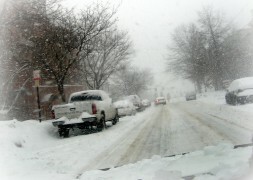 This entry was posted in Automotive, General and tagged Canada, driving, winter on 2009/12/09 by Jeff Ivany. Well, I got up this morning with the dog around 6:15AM and got to see the start of our first snow of the season. In the hour or so it took to get ready to go to work, my truck was well covered by a blanket of new snow. Fun! It’s stil coming down at a rather heavy rate. The drive to work was sort of amusing, a fair number of cars were off the road on the 416, way more than I expected. I guess some people didn’t quite remember how to drive on a snow covered road. I had a little fun in Kemptville before I got to the main road. The truck doesn’t have any weight in the back at the moment so it was a little squirrelly on the corner near the cemetery – how appropriate. ;) I’ll have to get my sandbags in there tonight since they are predicting snow for the next couple days. This entry was posted in General, Kemptville and tagged driving, Snow, truck on 2005/11/24 by Jeff Ivany. a) Stay in your wide open lane and start to accelerate? b) Stay in your wide open lane with your left turn signal on and accelerate? c) Move into the wide open lane to the left of you once you have checked that there is nothing there (there isn’t)? d) Slow down to half the speed limit and have your passenger try and tell you when to change lanes instead of making use of the wide open lane in front of you! This entry was posted in General and tagged driving, Ottawa on 2002/04/04 by Jeff Ivany.